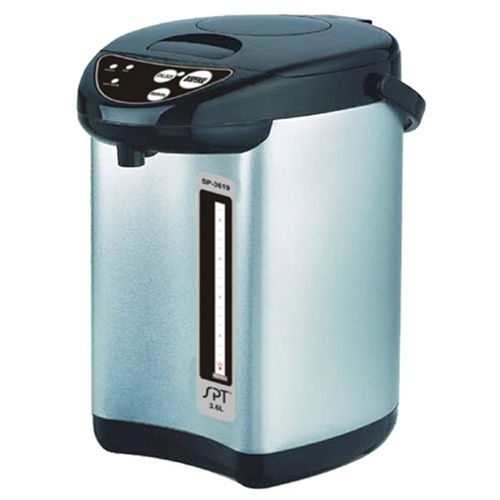 Sunpentown 3.6 Liter Hot Water Pot with Dual Pump System from HealthyKin.com features one-touch auto dispense and a manual air pump. The air pump allows water to be dispensed even when power is cut off. Ideal for tea lovers or anyone who needs hot-water handy. User friendly - simply add drinking water and unit automatically starts to heat water to boiling point. Maintains temperature at boiling point. Stainless steel body with black trimmings for a sophisticated look. Note: Not suggested for use in regions where sea level is above 300 feet. Pot may stay in Boil status and not switch to keep warm.